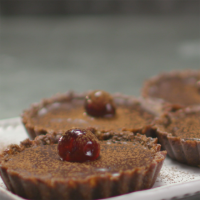 These vegan tarts can be made in advance, and served straight from the fridge. 1 Preheat the oven to 180°C, gas mark 4. For the tart crust, tip the hazelnuts onto a roasting tray and roast for 6-8 minutes until golden; set aside to cool completely. Once cool tip the nuts into the bowl of a food processor and whizz, pulsing until just finely ground, (take care not to over-blend or the nuts will release too much oil). Tip in the cacao and pulse again until combined, then add the maple syrup, coconut oil and a pinch of sea salt. Pulse until just combined. 2 Line 4 x 9cm tart tins with a large square of clingfilm and press a quarter of the tart crust into each, using oiled fingertips to evenly cover the base and sides. Chill for at least 2 hours. 3 Spread 1 tbsp cherry conserve over the base of each tart. Next place the maple syrup in a mixing bowl and, with a balloon hand whisk, whisk in the cacao 1 tablespoon at a time. Whisk in the melted coconut oil a little at a time until you have an emulsified mixture. If the mixture is too thick, set the bowl over a pan of simmering water briefly to warm up the mixture. Stir in a pinch of sea salt, then pour into the tart cases. Top each with a glacé cherry and chill for at least 2 hours or overnight before serving, dusted with a little more cacao powder, if liked.